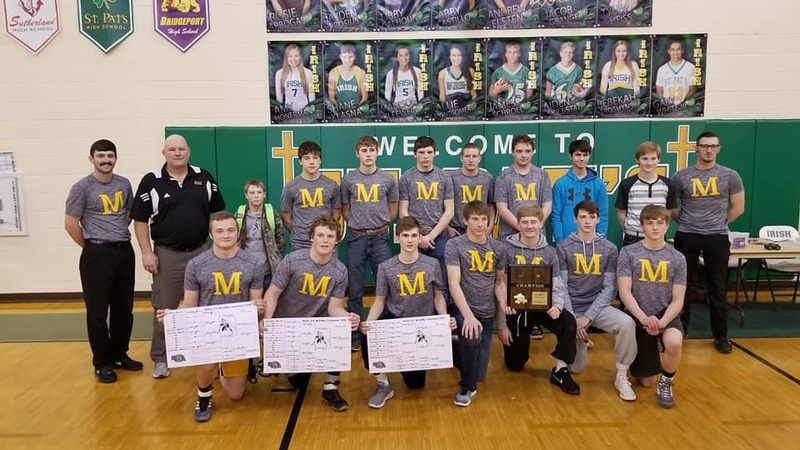 Mullen took D-4 Districts wrestling championship, with a team score of 167. Maxwell was 2nd with 140 and Morrill came in 3rd with 131. The 8 qualifiers include: 113 – Teven Marshall (39-4) placed 1st, 126 – Brady Gracey (32-5) placed 3rd, 132 – Jade Lovitt (29-4) placed 3rd, 138 – Zachary Sweet (12-7) placed 3rd, 145 – Brandon Cooley (23-7) placed 3rd, 160 – Josh Cox (19-8) placed 4th, 195 – Ty Kvanvig (22-9) placed 1st, 220 – Clayton Hassett (33-9) placed 1st. Mullen coaches were also named D4 District coaches of the year. State wrestling begins on Thursday morning at 9:30 with live coverage on KVSH Am 940 and kvsh.com.